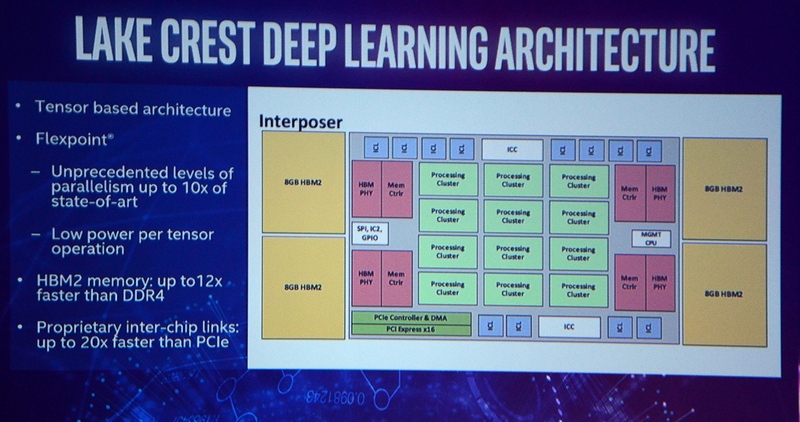 Intel has further detailed their Lake Crest chip that will be aiming at the deep neural network sector. 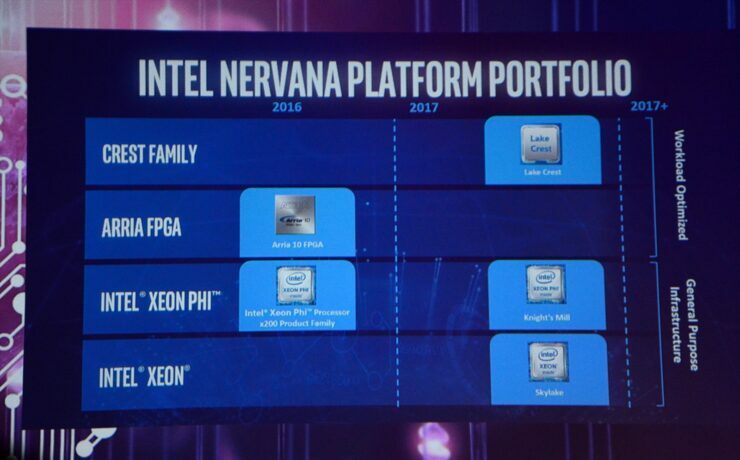 The new chip will be based around the Nervana platform which would deliver an unprecedented amount of compute density in silicon that delivers more raw power than modern GPUs. 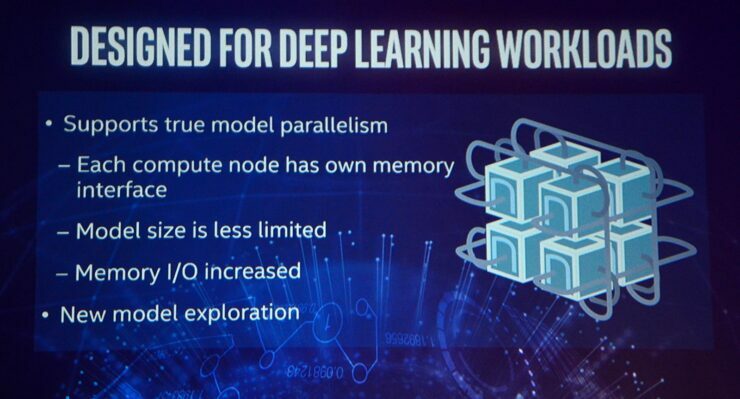 With the rise of AI learning in the tech industry, GPU makers such as NVIDIA and AMD have made chips that are specifically designed for DNN (Deep Neural Network) workloads. Intel wants to enter this ground with the Lake Crest silicon which is said to deliver more raw power than the fastest DNN GPUs available today. The chip will feature technology developed by the deep-learning startup, Nervana. The software/hardware firm was acquired by Intel in August 2016 for more than $350 Million US. 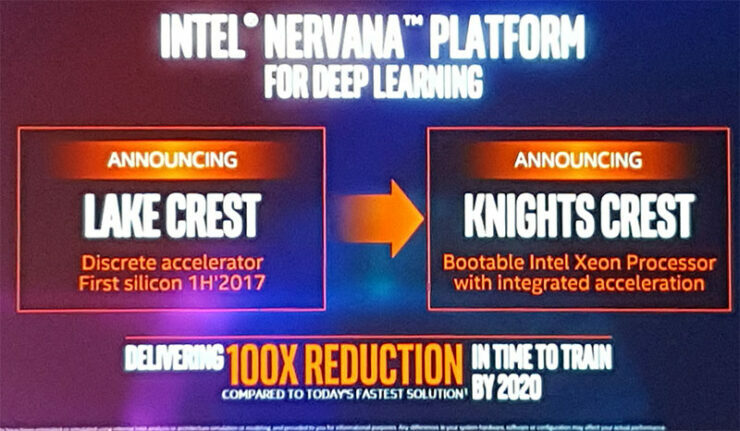 The first chip and systems to utilize the new Nervana based technology would be known as Lake Crest and Intel also named the follow up as “Knights Crest”. 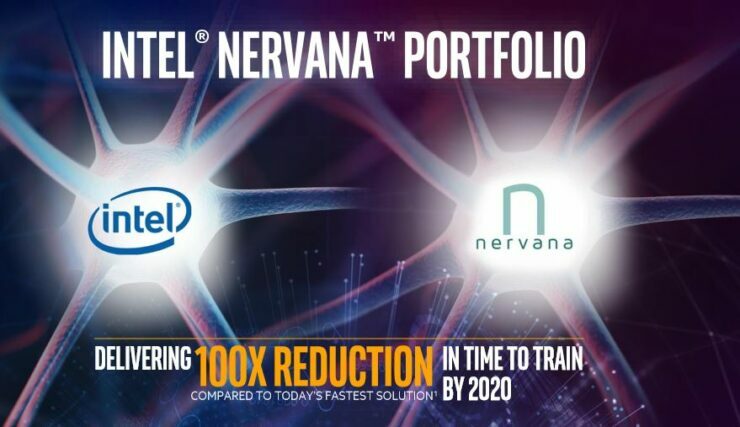 The Nervana platform which consists of an entire range of deep learning (DL) optimized products which would include Lake Crest and the recently announced ARRIA FPGAs which can also be programmed for special requirements and tasks such as AI learning. 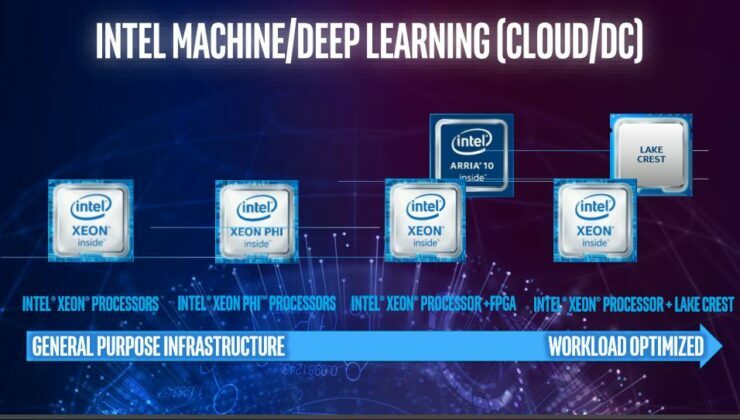 Both Lake Crest and ARRIA FPGAs will be working together with Intel’s Xeon processors. 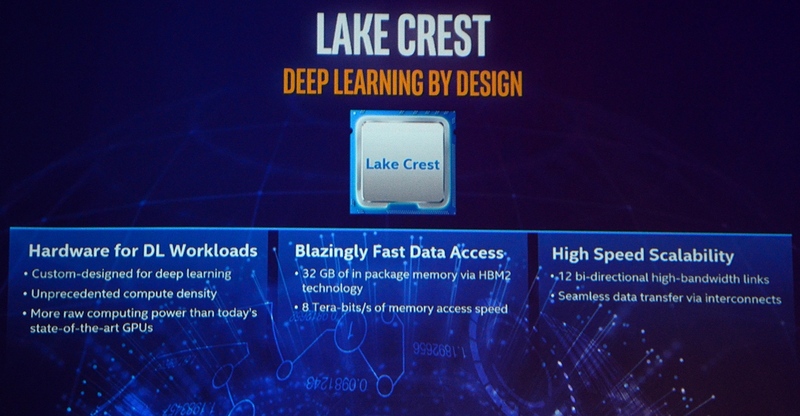 The Lake Crest chip will operate as a Xeon Co-processor but is entirely different to the Xeon Phi hardware. It is specifically designed to boost AI workloads at an unprecedented pace. 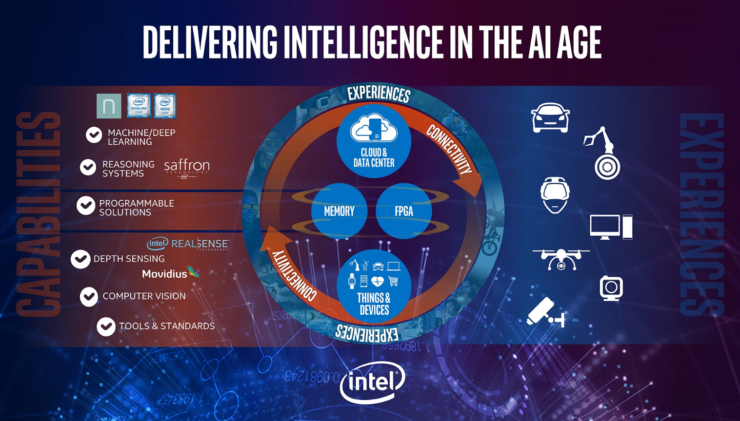 Intel is using a new architecture to be known as “Flexpoint” which will be used inside the arithmetic nodes of the Lake Crest chip. 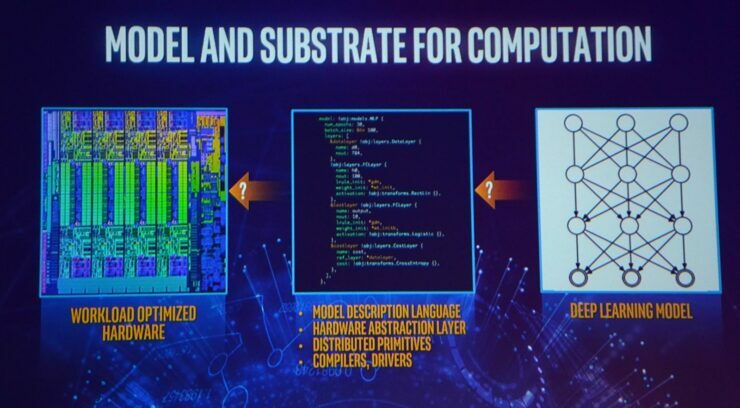 This will increase the parallelism of arithmetic operations for the chip by a factor of 10. The chip will also feature a MCM (Multi Chip Module) design. The discrete co-processor will feature a total of 32 GB of HBM2 memory. This will come in the form of four 8-Hi stacks which will deliver a total of 1 TB/s memory speeds at the rated clock speeds of 2 GHz. The Lake Crest chips will be available for testing during first half of 2017 and will be sampled to limited partners in the second half of 2017. Also to note is that the memory access speeds are rated at a whooping 8 Terabits per second. Intel has also revealed that the chip will be highly scalable which is something their CEO, Brian Krzanich, has already stated to be the path forward for AI learning. The chip will feature 12 bidirectional high-bandwidth links and seamless data transfer via the interconnects. These proprietary inter-chip links will provide bandwidth up to 20 times faster than PCI Express links. A detailed Lake Crest block diagram has been posted by Golem.de which shows the chip in more detail. We can see four 8 GB HBM2 memory blocks that are separate from the main die but will be featured on the same chip interposer. The chip contains 12 processing clusters which will feature several cores. Exact number has not yet been determined. Each HBM2 memory has its own HBM controller so there are four in total. There are 12 ICL (Inter-chip links) blocks for each processing cluster. There’s also a CPU management controller, SPI, IC2, GIPO, PCIe controller (x16) and DMA. The roadmap shows that Intel will have Lake Crest announced for testing at the same time as their launch of the new Knights Mill (Xeon Phi) and Xeon E5 V5 Skylake parts.